Dunne, Brad. "Nanaimo Bar". The Canadian Encyclopedia, 07 February 2019, Historica Canada. 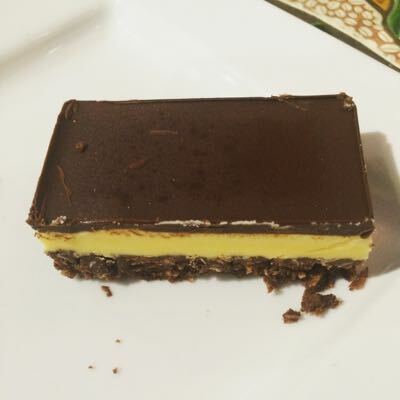 https://www.thecanadianencyclopedia.ca/en/article/nanaimo-bar. Accessed 25 April 2019. The Nanaimo bar is a no-bake dessert bar that traditionally consists of three layers: a graham wafer crumb and shredded coconut base, custard-flavoured butter icing in the middle, and a chocolate ganache on top. It is named after Nanaimo, British Columbia, where it was popularized in the years following the Second World War. It subsequently rose to wider prominence after Expo 86. 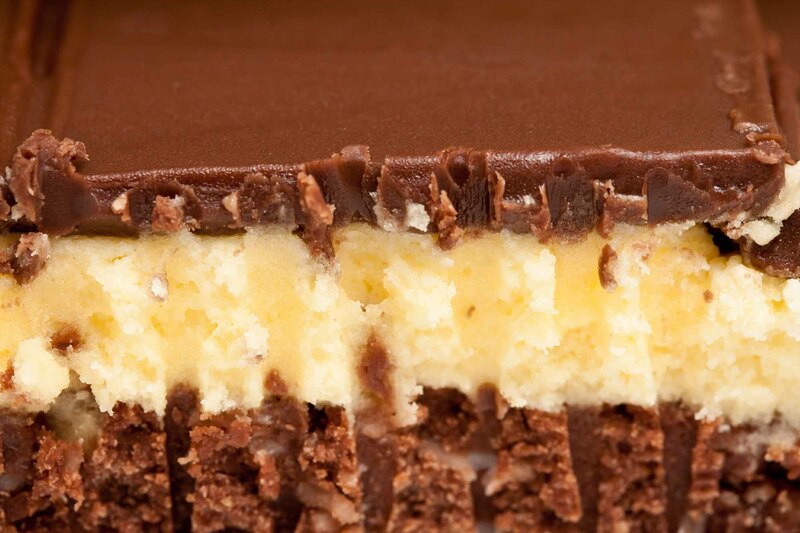 In 2006, the Nanaimo bar was declared Canada’s favourite confection by a reader’s poll in the National Post. A Nanaimo bar at the Blue Moose Cafe in Hope, BC, 6 August 2016. Much like the butter tart and date square, the Nanaimo bar fits Canada’s apparent predilection for rich, decadent sweets. It is a dessert bar that requires no baking and generally consists of three layers: a graham wafer crumb and shredded coconut base, custard-flavoured butter icing in the middle, and a layer of chocolate ganache on top. There can be some variations with each of these layers — e.g., adding mint, mocha or other flavouring, as well as food colouring, to the icing centre, or various nuts to the base — but a classic Nanaimo follows the traditional trifecta. There is a long tradition of no-bake desserts, dating back to the beginning of the Common Era when Marcus Gavius Apicius described making a jelly with bread crumbs soaked in wine and cheese, and chilled in snow. More recent is the English trifle, made of stale sponge cake brushed with liquor, layers of custard and jam, with cream on top, which dates back to at least the late 16th century. Quick refrigerator dessert squares exploded in popularity following the Second World War when butter and sugar	became widely available after years of rationing. Sweet tooths ruled the day with a plethora of recipes calling for marshmallows, sweetened condensed milk and crumbled cookies. No-bake desserts such as the Nanaimo bar also grew in prominence due to the cultural mores of postwar North America. In her book Baking as Biography, Diane Tye notes that expensive and time-consuming dainties were considered a status symbol. Although the Nanaimo bar requires several expensive pre-made goods, its appeal had more to do with conspicuous consumption than with saving time. In addition to being a status symbol, the time needed to prepare Nanaimo bars for entertaining guests reflected the leisure time ostensibly afforded to women outside the workplace. However, some oral histories place the creation of the bar in earlier time periods and different locations. Aimee Greenaway, interpretation curator at the Nanaimo Museum, has said that there were stories of families “sending Nanaimo bars on sailing ships from England to Nanaimo… but we haven’t been able to find anything to back that up.’” In the 1980s, a member of the Women’s Auxiliary to the Nanaimo Hospital claimed that their recipe came from one for “Chocolate Fridge Cake” published in the Vancouver Sun in 1936, but such a recipe cannot be found in the Sun’s archives. Meanwhile, Jean Paré, author of the Company’s Coming series of cookbooks, claims that the bars originated in Alberta and were called “Smog Bars.” Paré, who was born in 1927, claims to remember her mother and grandmother making them in Alberta prior to 1947. “Everybody made them: graham-cracker crust, cocoa, Bird's Eye custard in the filling,” she has said. However, scholar Lenore Lauri Newman conducted an exhaustive search of Albertan cookbooks from the 1920s and 1930s and found no such recipe. Susan Mendelson is perhaps most responsible for commercializing the Nanaimo bar. She sold the bar during the 1970s to help pay her tuition, and in 1979 founded The Lazy Gourmet, a cafe and catering company in Vancouver, which claims to be the first business to sell the dessert. Mendelson wrote the official cookbook for Expo 86, held in Vancouver, and included the Nanaimo bar. In conjunction with Expo 86, Nanaimo introduced the town’s mascot, a walking Nanaimo bar named Nanaimo Barney, and Mayor Graeme Roberts held a contest to determine the definitive Nanaimo bar recipe. The winner was submitted by Nanaimoite Joyce Hardcastle. After that, the Nanaimo bar began to be sold on BC Ferries and spread in popularity across Canada. It can now be found in Costco, Starbucks and countless cafes in Canada and the United States. A variation known as “prayer bars” is also popular in the American Midwest. In a bid to take advantage of the bar’s popularity, the city of Nanaimo launched a tasting trail much like Ontario has done for the butter tart. Different locations in and around Nanaimo serve different variations on the classic dessert, from flavours such as maple bacon and peanut butter to deep-fried Nanaimo bars, Nanaimo bar spring rolls, Nanaimo bar waffles and cheesecake and Nanaimo bar coffee and cocktails. Following a 2006 poll, the National Post declared the Nanaimo bar Canada’s favourite confection, beating out offerings such as Coffee Crisp, Beaver Tails, Cherry Blossoms, McCain’s Deep’n Delicious cake, Jos Louis, Tim Hortons’ Iced Capp, and Laura Secord chocolate. For the bottom layer, melt a ½ cup unsalted butter (European style, cultured), a ¼ cup sugar, and 5 tablespoons cocoa in the top of a double boiler. Add 1 beaten egg and stir to cook and thicken. Remove from heat. Stir in 1¾ cups graham wafer crumbs, 1 cup shredded coconut, and ½ cup finely chopped almonds. Press firmly into an 8" x 8" pan lined with parchment paper. For the middle layer, cream ½ cup unsalted butter, 2 tablespoons and 2 teaspoons heavy cream or whipping cream, and 2 tablespoons vanilla custard powder. Gradually add 2 cups icing sugar to the creamed mixture. Beat until light and fluffy. Spread over bottom layer. For the third layer, melt 4 squares of semi-sweet chocolate (1 oz. each) and 2 tablespoons unsalted butter over low heat. Cool. Once cool, but still liquid, pour and smooth over second layer and chill in refrigerator. Cut into small squares to serve.